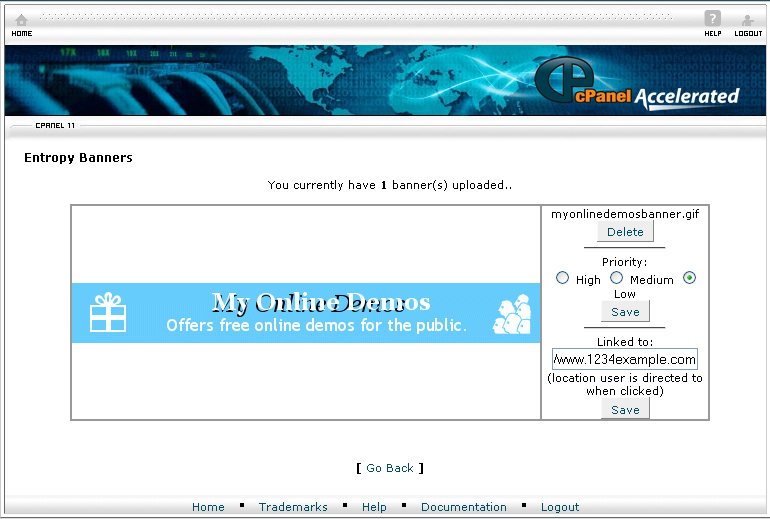 cPanel has an application which allows you to manage banner rotation for your website. The Entropy Banners is useful if you want your visitor to see a different logos or advertisements on your site. 1. 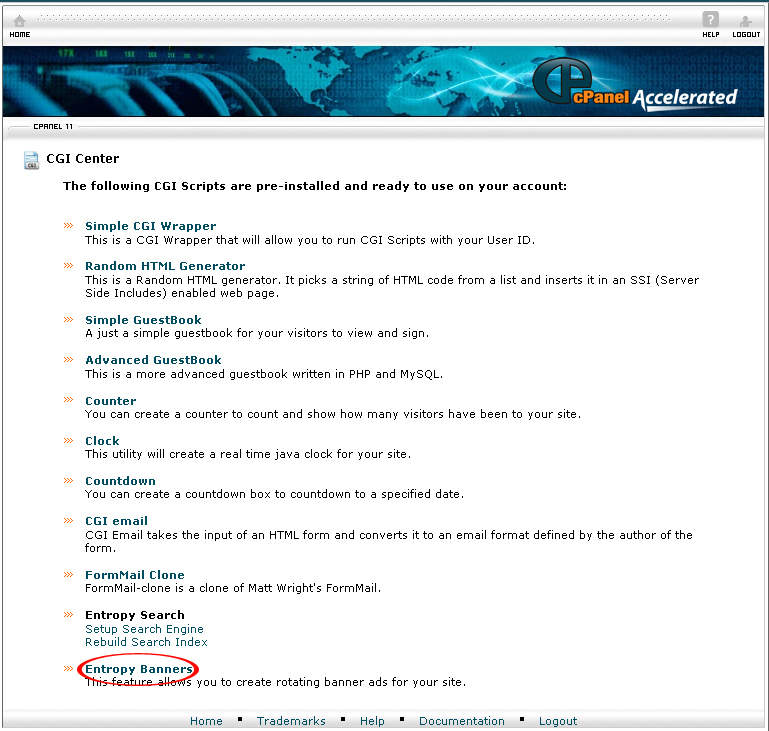 On the homepage of your cPanel, click on the CGI Center under the Softwares / Services. 2. Click on the Entropy Banners link. 3. Click on the Add Banners button. 4. You will see 12 upload boxes. Select the banner images from your computer by clicking the Browse button. 5. After you have selected the image files, click the Upload button. The files will be uploaded to /home/mydemos/public_html/entropybanner/. 6. When the files are successfully uploaded, you will see a confirmation message on the screen. 7. After that, click Go Back. 8. Click on the Modify Banner button. 9. You can set the priority of the banner by selecting from three options including High, Medium and Low. After you have set the priority, click the Save button. 10. Under Linked to, enter the address of the web page where you want the user to be redirected to when clicked. 11. The Entropy banner is now successfully set up. 12. On the main page of the Entropy Banners, copy the <!–#include virtual=”cgi-bin/entropybanner.cgi”–> code. 13. Paste the code into where you want the banner to display on your web page. The web page must be saved in .shtm or .shtml in order for it to function properly with the Entropy Banner rotator. 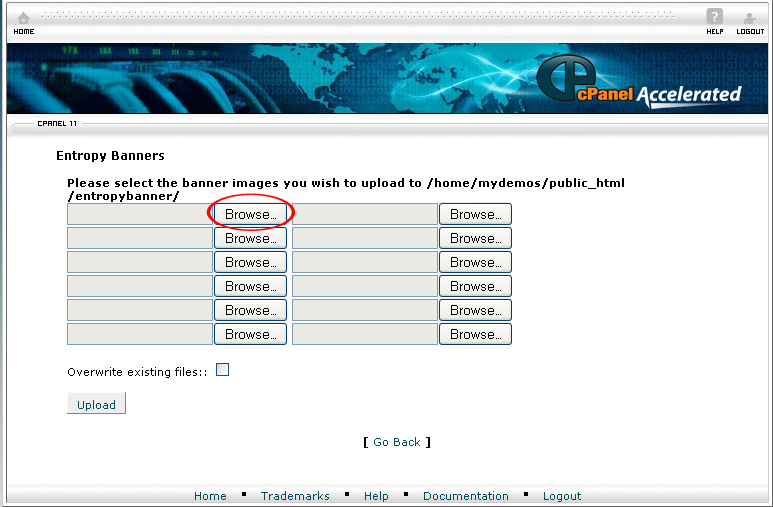 By following the instructions above, you will be able to create a rotating entropy banner.